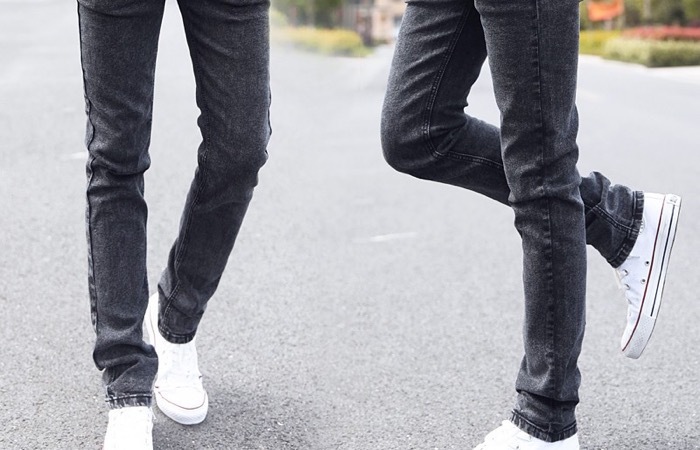 If you’re tired of your old jeans or jogger pants and want to try a new look, you can taper pants to make them look skinny and give you a whole new fashion sense. You may also want to learn how to taper pants simply because you need to keep your cuffs away from your bike chains. Whatever is your reason, this guide will show you a simple process to taper pants on your own. It could be expensive to have your pants altered by a professional. 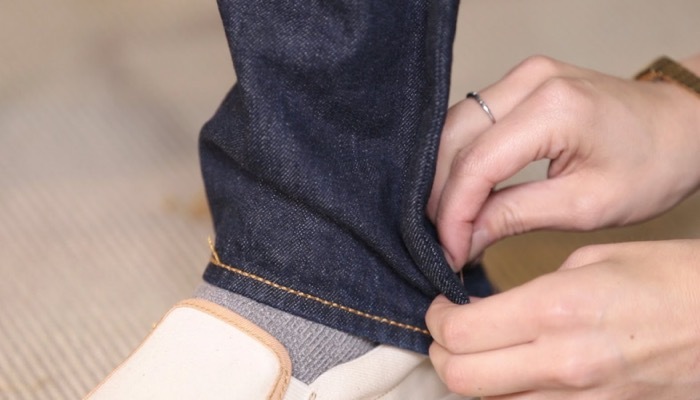 With a few tools and a little understanding of how pants are sewn, you can easily taper pants at home. Before we go to the actual steps to taper pants, here are the preparations that you need to do to ensure that everything goes smoothly. First, you need to turn the pants that you want to taper inside out and wear them. Then you need to mark the line that you want your pants to have. You can use either pins or a tailor’s chalk to do this. 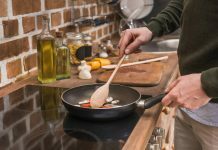 You might need a friend or an extra pair of hands to help you with this step. Pinch the seam of the legs down to the size that you want and either pin it in place or draw a line with the chalk. It is easiest to narrow the legs at the side seams as compared to any other part so stick with the seams. For this step, you have to pin the mark that you made on the legs. See if you can still take off the pants while the pins are in place. 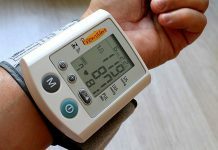 This will tell you if you are tapering too much. If the opening of the leg is too small for your foot to pull through, what you can do is to add a slit and sew a zipper or button at the bottom of the legs. You can also simply adjust the pins. Now that you know the proper place where to taper your pants and have made the proper marks, you are ready to do the tapering. Take off the pants and find a flat surface for you to work on. It’s best to sit down and work on a table. 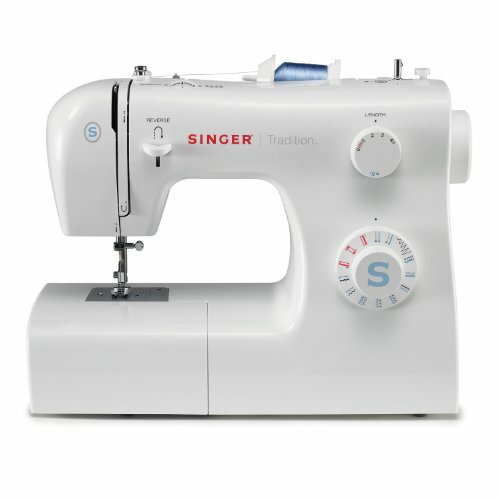 Prepare your seam ripper and undo the stitching in the hem or bottom cuff of your pants. After removing the stitches, iron the legs smoothly to remove any pleats or creases on the bottom of the pants. If you’re having difficulty straightening out the pants, you can use starch to help iron it out. 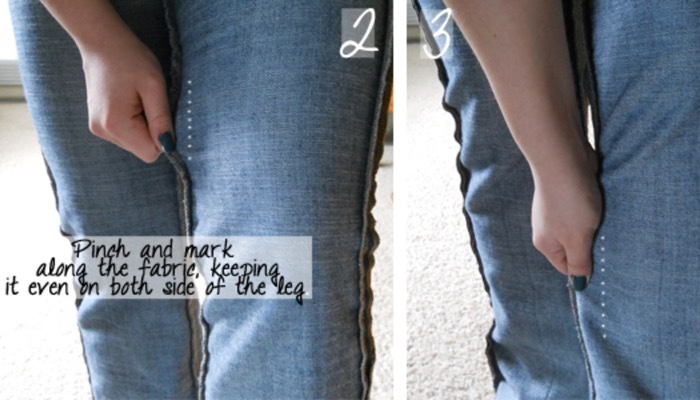 Using the seam ripper again, undo the seams of the jeans up to the top of the area that you marked for tapering. You have to allot at least an extra inch when you open the seam that you marked because you are going to sew on it. Make sure to check that the opened seams match on all sides and on both legs of your pants. Now, you can put the pins back on the legs along the seam line that you marked. Sew a basting seam first so you can test the pants if they fit. This is a stitching pattern that is longer than regular stitches. It will hold the pants but they will not be permanent. Wear the pants again to see if you can easily put them on and take them off without a problem. If the fit is good, you can go ahead and re-stitch the line with a regular stitch to taper pants. Once you are happy with the stitch that you made, you need to cut off the excess fabric around half an inch from the seams. 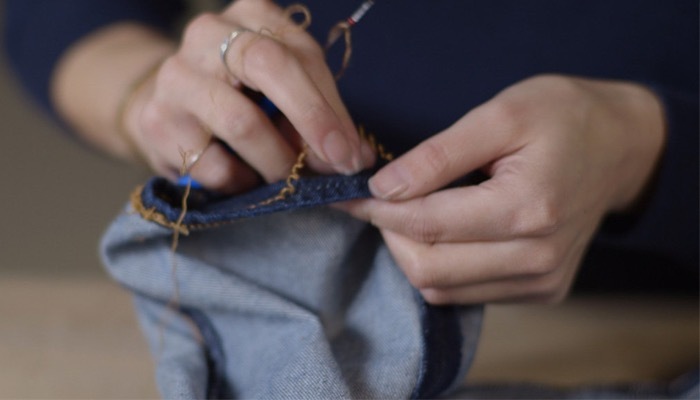 If you want to prevent the pants from fraying, you can use a fray-check or any similar product. You can also stitch the raw fabric edges in a zig-zag pattern to prevent fraying or cover them in bias tape. Finally, you would have to put the hems back on the pants. You can use a sewing machine for this one to create finer stitches. Make sure to keep the length even on both legs of the pants. 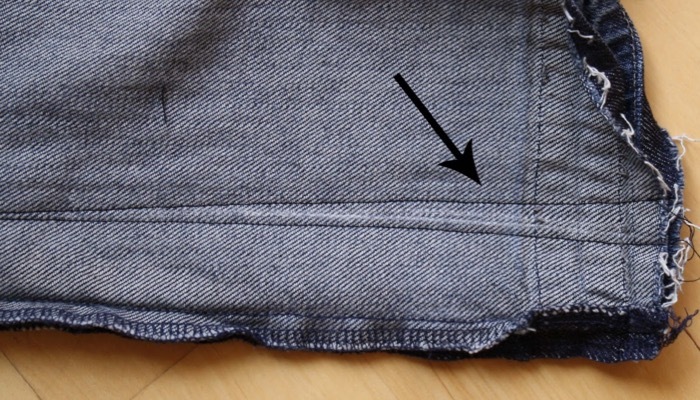 You should also do the steps above to prevent fraying at the hem seams. 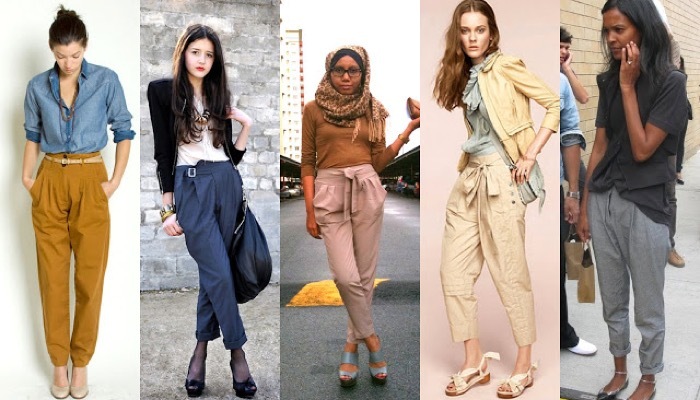 You can now wear your newly tapered pants and experiment with new fashion. Now that you have a new style after you taper pants, you might be wondering what’s good to wear with your newly tapered pants. You may find that your usual shirts do not look as well with them. The best type of shirts to pair with tapered pants is tops and jackets that hit high on your thighs. This will give the pants a flattering fit. Match the pants with bright colors such as cobalt, red, or cranberry. These pants look good with fabrics that move so you can try wearing paper-thin wool. For shoes, you are best wearing pumps after you taper pants. If you want to look more casual, you can wear Oxfords or loafers. Oxfords are great if you want to show a little skin between the hem of the pants and the shoes. It’s probably best to stay away from ankle boots with socks because they do not go well with tapered pants. Flats with low vamps also work well with tapered pants. You can taper pants for almost any look that you want to go for. Whether you want to have a formal look or dress down for the office. You can even experiment and might be surprised that printed shirts also look good with them. Designers in London are playing with prints to go with tapered pants and they look surprisingly better compared to their plain and stark alternatives. It’s combining the simplicity of the pants with the party top.